Tableau Software will release a big update to its business intelligence software in the coming weeks, promising that customers will be able to spend more time on data analysis and less on "data wrangling." Tableau's premise is to combine databases and computer graphics in a way that makes data visualization considerably easier for the average user. The company, born at Stanford University, was launched in 2003 and had its first $100 million-plus revenue quarter last year, when annual sales grew 78 percent. Tableau 9.0 promises numerous new features for data preparation, query performance and more. Here are a few things you can expect in the upcoming release. Tableau already supports more than 45 data sources out of the box -- including Hadoop, Salesforce and Excel -- but brand-new with version 9.0 is support for statistical files, said Francois Ajenstat, vice president of product management. What that means is that SAS, SPSS and R files can now all be accommodated by the software, he said. Anyone who works with data often knows that preparing it for analysis -- "cleaning it up," in other words, to rid it of undesirable features such as empty rows -- can be just as important as analyzing it. With version 9.0, Tableau will add data-preparation features designed to make it easier for users to clean the data they're about to work with. The idea, Ajenstat said, is to help users "spend more time on data analysis than data wrangling." Also new in Tableau 9.0 will be the ability to perform calculations on an ad-hoc basis, similar to what's possible in Microsoft Excel. "When you use Excel, you can just start typing in any cell to perform a calculation," Ajenstat said. "We've tried to add the same thing to Tableau 9.0. That makes it easy to stay in the flow and to answer the questions you have, freely experiment and try different things." First launched with Tableau 6.0, Tableau's Data Engine is an in-memory analytic database that's designed for fast queries. Now, improvements in Tableau 9.0 make it even faster, Tableau said, with features that are designed to make the most of the user's underlying hardware. In one case using a four-core commodity laptop, for instance, the new technology delivered a 10X performance improvement on 173 million rows of data. Thanks to a new "Parallel Queries" feature, meanwhile, Tableau 9.0 will take better advantage of the capabilities of source databases to execute more queries at the same time for faster dashboard performance on desktop and server. Tableau 9.0 also has new technology for database connections called Query Fusion that will look at all of the queries in the user's dashboard and find ways to simplify them into fewer queries. The result? Less work for the database and faster response times for the user, the company said. New selection controls, geocoding data and geographic search capabilities are also coming in Tableau 9.0, making it easier for users to answer questions that revolve around the notion of "where?" For example, "How do my sales in one city compare to this other one?" noted Tableau Public product manager Daniel Hom. Examples are new radial and lasso selection controls. Last but not least, Tableau will also include a new Admin Views feature that offers administrators a way to monitor and analyze data from their own Tableau server. 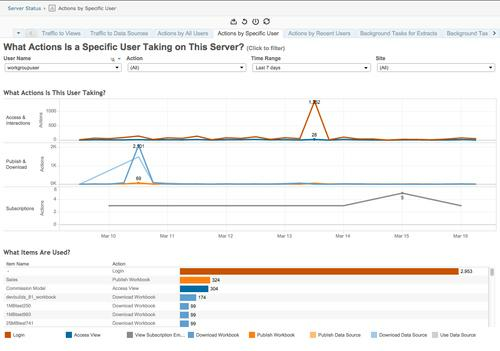 Using it, they can detect bugs, track user activity, plan upgrades and allocate resources. Currently in version 8.3, Tableau comes in desktop, server and online editions plus free public and reader versions. Now in beta, version 9.0 will be officially announced next month, the company said.